WEDDING BALLOONS NEW PREMIUM QUALITY PARTY SUPPLY: Use our Gold, Confetti and White Balloons for party favors, balloons decoration, party decoration, wedding, bachelorette, birthdays, bridal shower, baby shower,anniversary,Hawaiian Luau Party, Valentine's Day, Mother' Day, graduation party supplies balloons. 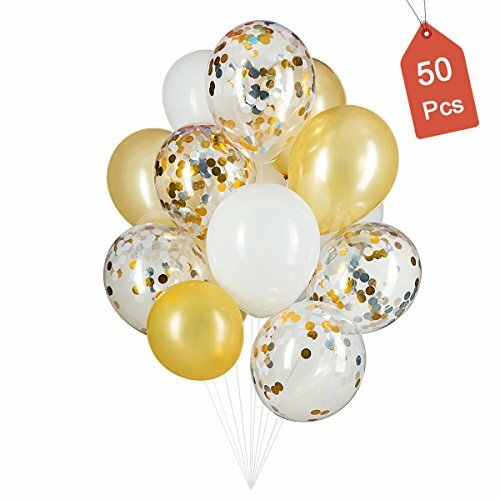 Use our Gold white & confetti balloons to liven up the party venue and win over the hearts of guests by giving balloons as party favors. BIRTHDAY BALLOONS BEAUTIFUL ORNAMENT: Party balloons are enough to make a ballon arch,balloon column,or multiple balloon bouquets and table centerpieces and any parties events.if you want have a perfect wedding or birthday parties,choose our latex ballons,Is definitely a perfect party decorations. BABY SHOW BALLOONS.EASY TO INFLATE TO USE :You can use HIGH GRADE helium to inflate our Gold, Confetti and White Balloons to the FULL 12 inches,and it will float more than 12 hours. You could also use pump to blow it up with air to hang them with ribbons. When blown up, each balloon has a diameter of 12 inches. The big size balloons are party supplies favorite ! ENGAGEMENT BALLOONS LONG LASTING AND STRONG: Our latex balloons are made from durable latex material,Strong and long lasting, and you won't have to worry about them tearing or bursting when inflated. QUALITY GUARANTEE - We stand behind our products and will always focus on your satisfaction. If you don't absolutely love,just send it back within 30 days and we'll promptly refund you in full.